The Southern Nazarene University tennis team participated in the USTA/ITA (United States Tennis Association/Intercollegiate Tennis Association) regional tournament in Springfield, MO last weekend, September 19-21. Senior Maria Andrianova lost in singles in a quarterfinal to Patricia Husakova, from Northeastern State. Andrianova fell 6-4, 6-2 in her last match at the USTA/ITA’s tournament. The day before the quarterfinal Andrianova had a around three hour match against Bernardita Muscillo from East Central University. This match was very tough for both of the players, but Andrianova took a win 6-2 6-2. Natalia Moreno and Andrianova lost their doubles to Harding University on the first day but showed a good game. Senior Moreno lost in the first round to Valeriia Efimenko, a sophmore from Northeastern State University. 6-1 6-2. 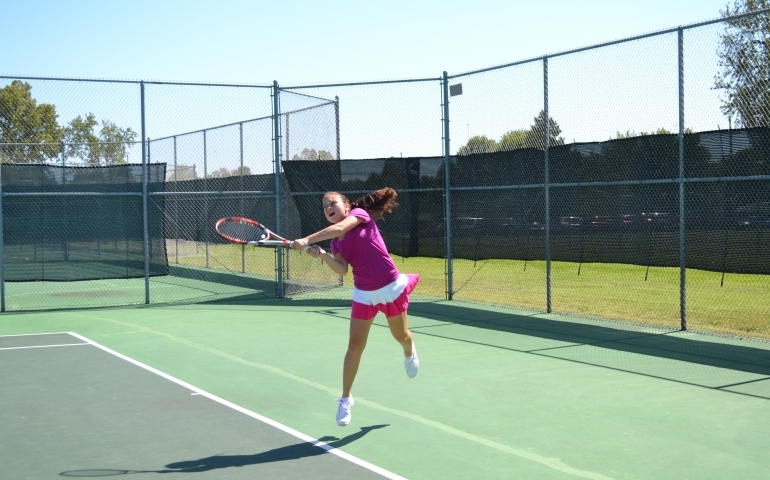 Freshman Polina Chala lost to Christina Zentai from Southwest Babtist University 6-0 6-4. Later on, Zentai won the final against the number 1 seeded Fanni Varga: 6-0 6-2. Senior Karina Kotova and freshman Polina Chala fell in the quarterfinal of their doubles on Saturday. They fell 8-3 to Laura Golubic and Gabriella Alves from Harding University. Kotova and Chala played together for the first time, and they showed a good game and great cooperation. “I think we play good together and can perform in a high level next semester. I’m looking forward to the spring season” said Kotova. It was a great experience for Crimson Tennis to bond as a team. Girls showed their team spirit and supported freshmen in their first college matches. “It was my first experience playing the college level tournament and I enjoyed to share this with my lovely teammates, assistant coach and coach Charlie…” said Chala. The tennis team is going to play a Golden Sun Tournament at Arkansas Tech University in Russellville, AR on October 3-4. We wish them luck and will wait for a win. For those who are tennis fans or/and supporters of SNU tennis and interested in results of the ITA tournament, which was in Springfield, MO you can go to the link below and see the draw of whole tournament.